When it comes to your baby’s skin finding the perfect laundry detergent is very high on the list. After all, you are washing their clothes constantly and they are almost always fully clothed. So, whatever you use to wash them will always be in contact with their skin. For many of you, using a specially formulated baby detergent is more than enough because not all babies have issues with their skin. However, if you have found that your young one is susceptible to various skin issues, it may be time to find a better laundry detergent. One that is free of all the chemicals that can irritate a baby’s skin. There are so many different chemicals and ingredients in modern laundry detergent these days that it is enough to make your head spin. And add to that the issues you can get with diapers, and it gets complex, fast. So, in this section I want to quickly and simply point out the kinds of things that you want to avoid. And why. You should always go your own research and make your own decisions, but I will list the things that are commonly avoided, especially by people with sensitive skin. This is a starting point for many of us, but be aware this does not necessarily mean you won’t or can’t be allergic to something. It just means that it was tested and found to be ok, or cause less reactions than most substances. There is no government standard on the use of this word, so be careful making assumptions when you see it. One of the most common issues for skin is perfumes. People with eczema for example, often suffer from a reaction to perfumes. So, almost all the detergents in the list below will not have them (except one I think). Sure, it’s nice to have “fresh smelling” laundry, but it’s more important to avoid things that might irritate your child, right? Detergent manufacturers are always looking for ways to make our clothes cleaner, or at least, to look cleaner. And brighteners are indeed a magical chemical. They stick to your clothes and make them look whiter (or brighter in a sense). The concern is that many of these chemicals irritate some people and that they are on the clothes after the washing is complete. So, they are always in contact with the skin. Phosphates have been used in cleaning products for a long time because they are so good at breaking down dirt. Many studies have been done to show that phosphates are not the best thing for us humans to have around us, so they are best avoided in general. Sounds like some kind of zombie, but it’s actually a series of chemicals often found in laundry detergent that are usually not the most fun gals at a party. Many of them, such as NPE, have been banned in some countries (Canada, EU) but are often found on our clothes, even if we don’t wash with them. This is one that is kinda hard to avoid because it has become so ingrained in our cleaning products. Everything from soap to detergent usually contains some kind of Sulfate, often SLS or SLES (the most common), but there are many others. The concern is that these chemicals are so good at their job (removing things like oil) that they also remove many natural oils and proteins that we want to keep on our body. Things our body produces to protect us. So, there is a new movement to avoid sulfates, even though they are responsible for the “foam” or “lather” that we have come to associate with soaps and being clean. I have tried to find the best products, with the least chemicals that can harm sensitive skin. I have done that by using EWG’s guide to laundry detergents which show which products have those kinds of chemicals in them. The list below is in order of the best rated by EWG, at least up to number 6, then I have added Dreft at the end because although it is not on EWG’s list, it is commonly used by mothers for young babies. I have linked to the ingredients in that section, so you can see in detail what is in it. 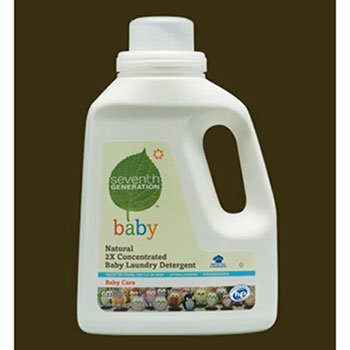 Green Shield have gone the extra mile to make sure your baby’s sensitive skin is taken into consideration with this USDA Organic detergent. I am actually struggling to find something that this detergent does not exclude that it should. It’s also made using non-toxic chemicals and is hypoallergenic. So you know that sensitive skin is going to love this laundry detergent. Of course, if you know Green Shield, you know they love to protect the environment too so this liquid is also septic system safe and uses 100% recyclable bottles made with sustainable sugar cane. What? I know. Manufacturers that also go the extra mile! 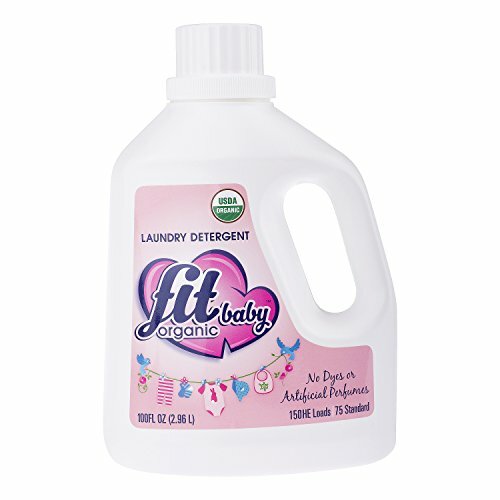 Another brand you may not know, Fit produces another USDA certified baby laundry detergent that has an impressive list of ingredients (or lack of bad ingredients I should say). The list kinda goes on forever. It’s impressive. 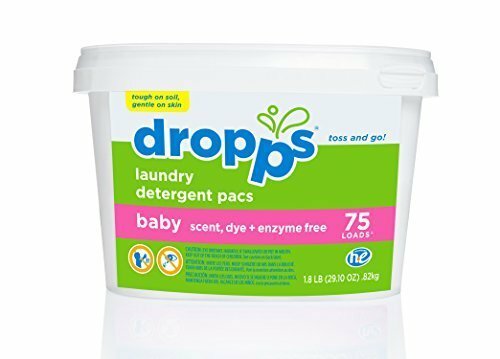 If you are worried about what chemicals might be in your laundry detergent and potentially harming your baby, then this one is for you. 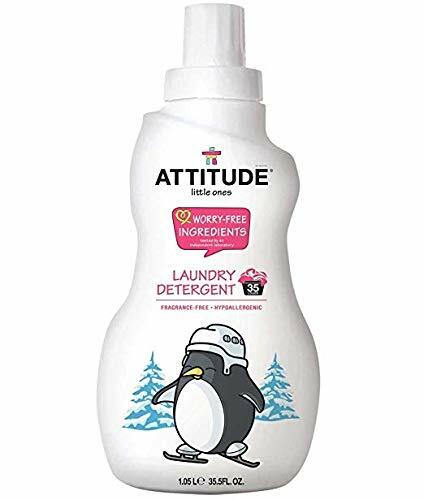 Getting an “A” rating on the EWG website (a website that checks all the nasty chemicals in washing products) this detergent is one of the best you can get for sensitive skin. If you are concerned about sulfates, which a lot of people are these days, then this product is not for you. It contains sodium coco sulfate. So, although it is a great product, it loses a few points here. They have also taken the environment seriously with recyclable materials and processes. However, they do use a sulfate, albeit not SLS like most manufacturers. Instead, they use Sodium Laurel Sulfate, which is not as common but can cause allergies in some people. Whether this is an issue for your baby is never a certainty, but personally I like to avoid sulfates. We are slowly moving down the list from the absolute best and chemical free soaps, to some that are still great for allergies and sensitive skins, but contain some chemicals (as most laundry detergents do). 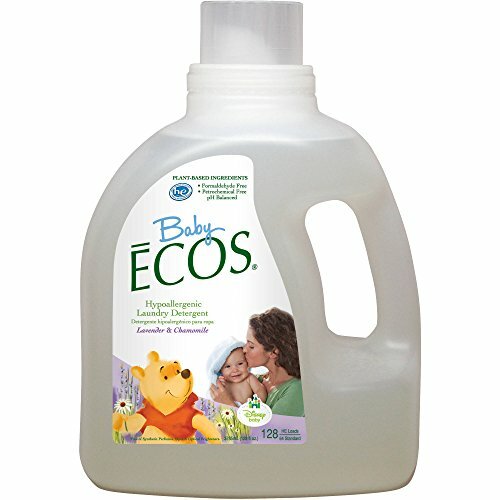 This one from ECOS has no phosphates, is PH balanced and hypoallergenic and made from plant-based materials. It does however contain a sulfate and lavendar & chaomile, which some parents may want to avoid if their baby is very sensitive. Seventh Generation are known for the environmental and plant-based products, and this one for babies is certainly not a bad option. They do not go to the same lengths as some of the manufacturers above, but their name and availability, as well as popularity seems to speak for itself. There are no brighteners in this product, as well as no scents, which is a great start. However, there is sulfate, which is not the end of the world, but for the purists out there, it may be a reason to skip this product. Many buyers are very satisfied with it though. 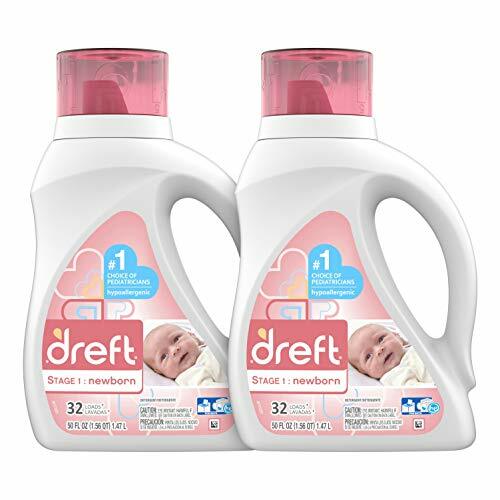 Dreft Stage 1 is well known as a great detergent for newborns and babies with sensitive skin. I list this one last because for me, it is not as focused on some of the issues we face with chemicals in our detergents as the others above. However, it may well be good enough for many. You can find the full list (and there are a lot) of ingredients here but the two that I want to highlight are sulfates and a perfume. Either of these may be something you don’t want to see on such a list if your baby is hyper-sensitive to such things. The formula is however designed for babies and is hypoallergenic, so it will certainly work for a lot of you. Which Laundry Detergent Is Right For Your Baby? 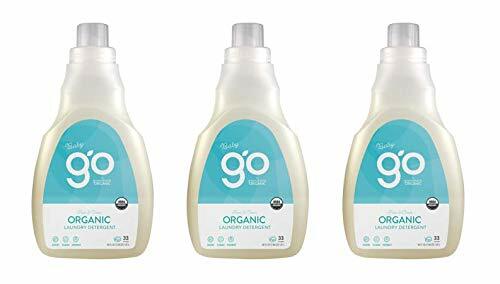 In the end it always comes down to a few key choices for any product and with this one, for me it is avoiding as many harmful (or potentially harmful) chemicals as you can, and trying not to pay an arm and a leg for a bottle of detergent. There are enough options in this list to find a good solution for your baby, just remember that I have listed them in order of best rating with EWG who try to help by highlighting all the chemicals that could be harmful to us. That is not to say they are 100% correct, but I always err on the side of caution. Finally, you may have to try a few different products to find the one that is best for your child. So, if you find they are not responding well to one, change as soon as you can.